IN THE BEGINNING WAS THE WORD [LOGOS], AND THE WORD WAS WITH GOD, AND THE WORD WAS GOD. 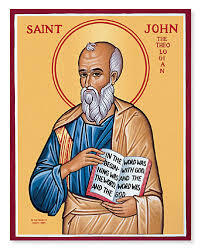 The Gospel of John was originally written in ancient Greek, and what is translated as “...and the Word was God” was, literally “AND GOD WAS THE WORD” (God “Deos” became capitalized in later versions.) So the Word, or Logos, was in the beginning. The beginning of what? Of the world. Which means that God must have existed before the beginning in order to have begun to create the world at the beginning. And the Word was there with God at the beginning. Most important, though, is the conspicuous contradiction that the Word was with God and was also God. How can anything, or anybody, be something and simultaneously be with it? It is not possible, so it must be untrue. The Christian churches will tell you that for God nothing is impossible and/or that it's a mystery which our imbecile minds are unable to understand. Give us a break! This translation is a transparent attempt to prove that Jesus of Nazareth was God himself. Just as they (the priests) will also tell you that God is one God in three divine persons. (God the Father – who is also Jesus; God the Son – who is also Jesus; and God the Holy Ghost – who is again Jesus?) Give us a break, Holy Father. And yet, if there is truth in the prologue to the Gospel of John, why is it so nonsensical? Perhaps the truth has been lost in translation, deliberately or not. Rudolf Steiner claimed that the correct translation is “AND THE WORD WAS A GOD.” Well, that makes sense, it means that God the Father was accompanied by another, lesser or associate god, called here the Logos or the Word. But is this interpretation grammatically defensible? I don't know Greek but, due to a quirk in karma, I studied Russian in an intensive, one-year course at the Army Language School in Monterey, CA, during the cold war. The obvious similarity between Greek and Russian is that they both use the Cyrillic alphabet. The Cyrillic alphabet is named after St. Cyril, who was a Byzantine Greek Orthodox bishop from the 9th century AD. St. Cyril and his brother St. Methodius were important early Orthodox missionaries among the Slavs in the Balkans and in Russia. During their work the two developed the Glagolitic alphabet in order to translate the Greek Bible into Slavonic, which eventually morphed into the Cyrillic alphabet. Otherwise the two languages are grammatically different. There is, however, another similarity which concerns us here: the Russian language has no articles. Therefore, if we want to translate “He is a funny guy” into Russian, it would be “He funny guy” (The verb “to be” isn't used in the present tense.) Greek, on the other hand, has definite articles (the), but no indefinite ones (a). In the case of “AND GOD WAS THE WORD,” we have no way of knowing, in either language, whether that is the correct translation or “AND A GOD WAS THE WORD” or “AND THE WORD WAS A GOD.” The indefinite article (a) did not exist in Koine Greek, the language of the New Testament, so we will have to allow the context to tell us whether or not to supply an indefinite article in our English – or Spanish or Geman, et al. - translation. The context in the beginning of the John Gospel clearly tells us that the indefinite article is necessary, to wit: “In the beginning was the Word, and the Word was a god,” because the Word was with God. Nevertheless, translations of the Greek Bible in all modern languages omit the indefinite article a, thereby completely changing the meaning. So who was Jesus of Nazareth if he wasn't God after all? According to Rudolf Steiner, Jesus was a human being – an extraordinary one, but still only a human being. It was at the Baptism in the River Jordan by John the Baptist that the “divine being” - Christ - began to gradually incarnate into the person of Jesus of Nazareth. The process took three years. In his artcle The Bible: Lost in Translation in this issue of SouthernCrossReview.org, Paul Carline points out that the “god” who created the world according to Genesis, was in fact the “Elohim” - a plural word in Hebrew denoting divine beings in the higher ranks of angels. It make sense, then, that the divine being who incarnated into the person of Jesus of Nazareth was one of those Elohim. The article “a” may be a humble one, but it can pack a punch in certain circumstances – a decidedly negative punch when it is missing.